This is what I did over the weekend with regards to strings/crumbs. 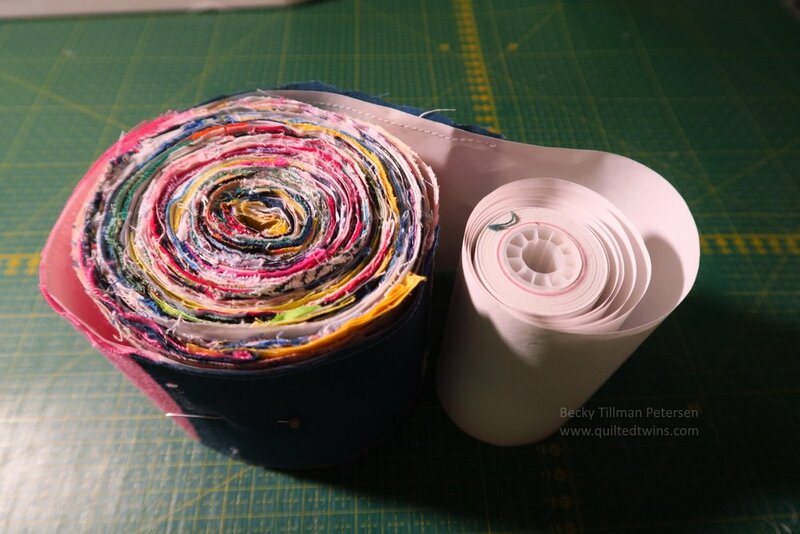 I also sewed pieces to my wide adding machine paper - wanted to do a minimum of 96” - I did.180”. But to be honest, I was running out of energy/interest and went and found some blocks that I didn’t want to use and I sewed them to the tape - as they then become “scraps/crumbs”. they were already in my tub of misc. blocks either I made or given to me - but these ones were ones I didn’t want to make into a top - they needed to either become this or another “A Hot Mess” type of quilt. I want these so I can continue the quilt top I started before I sent my machines to be repaired. That top looks like this so far - but I ran out of prepared scraps sewn on tape. I will continue to add to the top in strips of two - one on each side as I can. I’m really not “into” crumbs/strings right now, so I’m just trying to limp along doing some each weekend until something actually inspires me. In the meantime, I’ll try to keep using up what I create that week! But as usual, it feels like I create more scraps than I use up. And that’s what I did this weekend with regards to scraps and pieces. At least the tiny ones. I’m sorting triangles and trying to figure those things out, too! Make sure you check out what my sis has for you in the store! She’s working hard to give you great choices, at prices you can afford! Note - she has TEAL Dream Big panels in stock again!